Im currently looking for an experienced SEO guy, who can test and elaborate the plugin. As I am a backend developer. I don't know which features are essential to include, what things need to be changed, etc. If you are interested, just drop me a line. Also included is a preview of the Google search results which can be assessed using the plugin. The plugin provides this functionalities by registering a new Form Widget and thus can be used in any form you like. 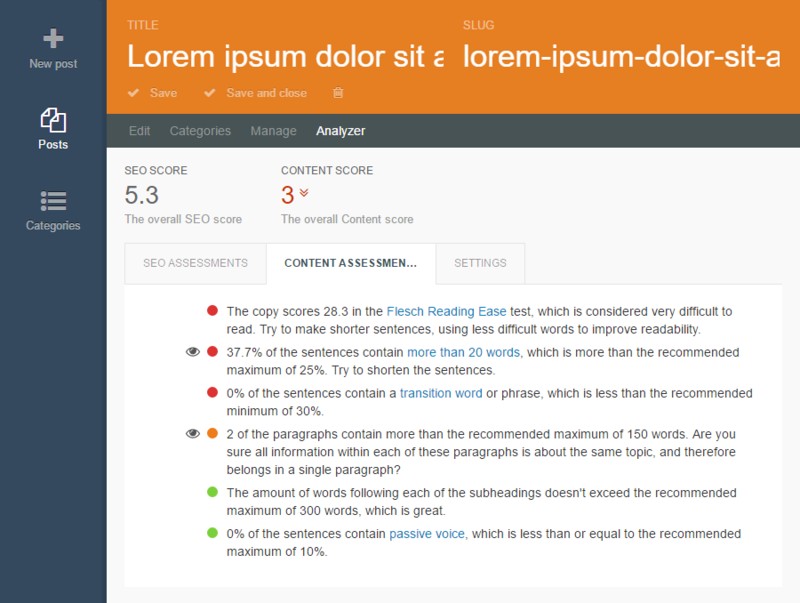 A sample integration for the blog plugin is provided. Please note that this plugin is in a beta stage, meaning it is not thoroughly tested. Also, this means I strongly advise you to provide feedback and report any errors you get back to me, so I can have a look on them and hopefully fix them. Add meta_description to the rainlab_blog_posts table to persist the meta description. implemented! Q: Does this work with the markdown editor as well? A: No, currently only the richeditor type is supported. 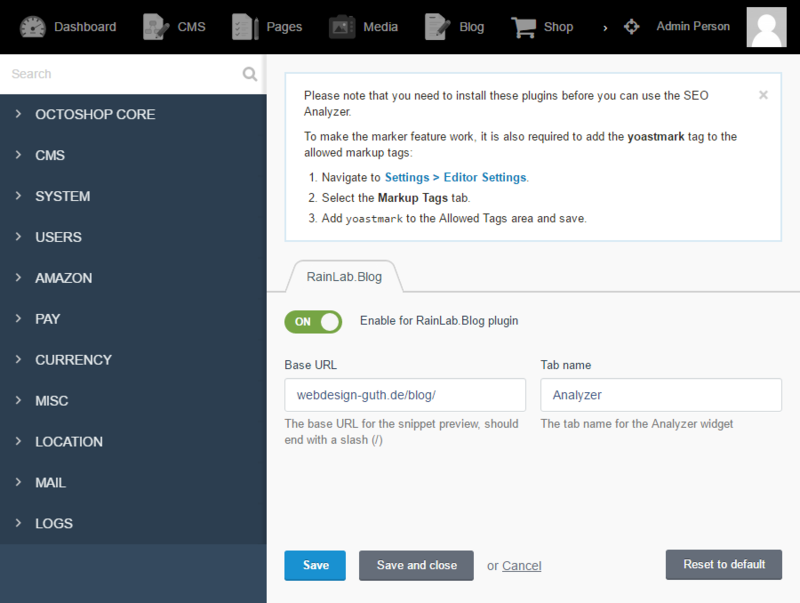 That's also why for the RainLab.Blog integration the editor is changed by the plugin. Q: Is this usable just yet? A: The blog integration has been tested by me, however I can not guarantee the correct function in combination with other plugins or special setups. Also, the plugin is in a beta stage, so not all things work smoothy yet. Q: Which language is used for the assessments? A: The plugin will load the translations based on the current backend language. All metrics and hints from the analyzer are displayed in this language (if available). The plugin assumes, that the text to be analyzed is written in the same language. 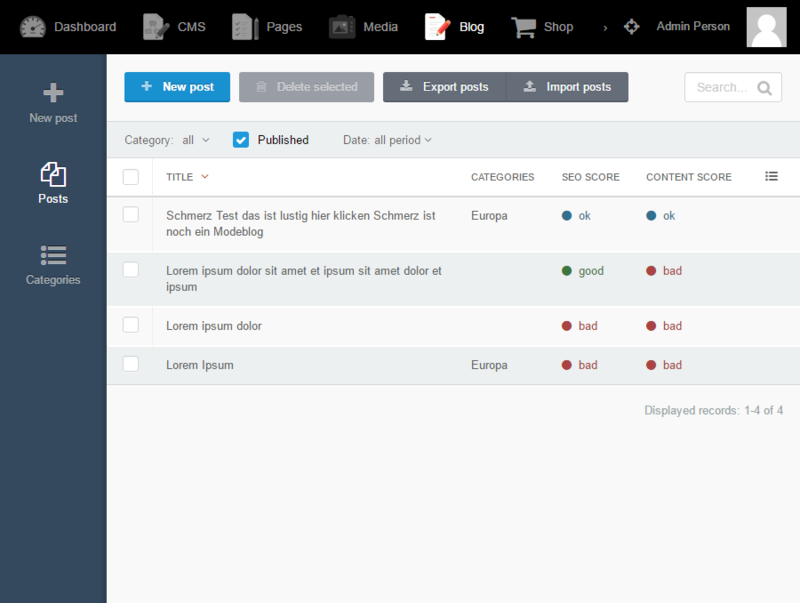 The posts list view with score columns added. As this is a paid plugin, you need to add it to a project. Once this is done, go to Settings >Updates & Plugins and click Attach Project. This will download all plugins connected with this project automatically. Navigate to Settings > Misc > SEO Analyzer Settings. There, you can enable the different integrations for this plugin for a quick plug-and-play. Please follow the instructions provided to guarantee a seamless user experience. The RainLab.Blog integration replaces the Markdown editor with a Richeditor (WYSIWYG) instance, adds the Analyzer to the Post form, adds two score columns to the Post list and implements the required Model behaviour (see below). Note: As of now, the only integration available is RainLab.Blog. This is needed to load the translation files for the widget and synchronize the focus keyword and score values with the database. The plugin also registers a new list column type: score. 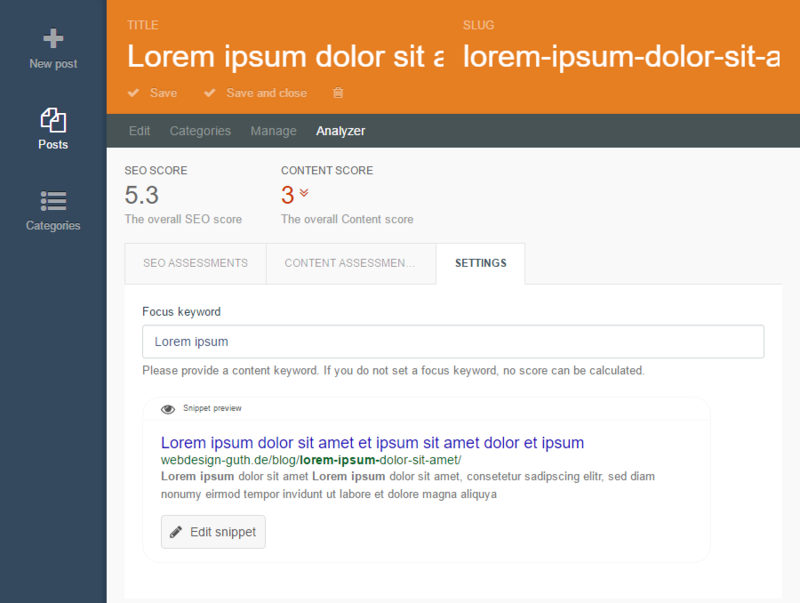 This can be used in a columns.yaml to properly format the SEO and content scores. Again, the Model behaviour needs to be implemented for this feature to work. I am not getting a snippet preview, what am I doing wrong? 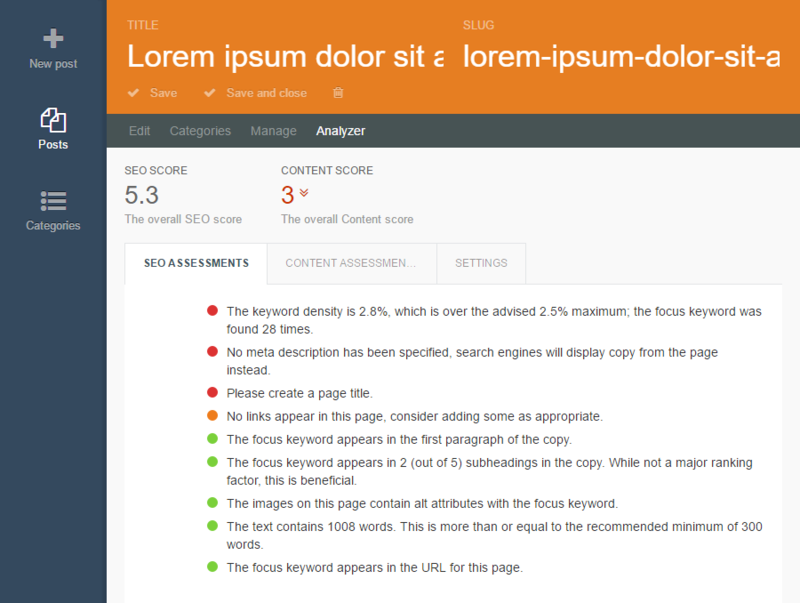 Very nice plugin and easily to use for optimize the SEO of the blog posts. Implement "Relevant words" and "Prevously used keywords" features. Added the focus keyword to the columns list.